OREM, Utah – March 13, 2013 – The Keflings are spreading like rabbits. A World of Keflings, the popular city-building game that first made a splash on Xbox Live Arcade, arrived on the Windows 8 Games Store today, becoming the latest of a handful of XBLA titles to release on Microsoft’s new operating system. As an Xbox game on Windows 8, A World of Keflings makes use of the power of Xbox Live to enhance the gaming experience. By signing into Xbox Live, gamers can play as their individualized Xbox Avatar, compete for high scores on Xbox Live Leaderboards, and unlock 20 all-new Achievements. Even gamers who have already earned full Gamerscore from the Xbox 360 version of A World of Keflings will be able to earn an additional 200 Achievement Points when playing on Windows 8. 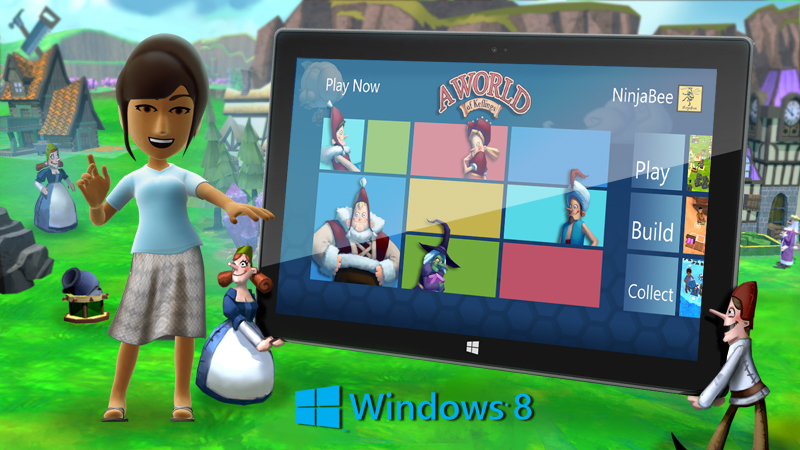 A World of Keflings on Windows 8 also provides intuitive touch controls and a new picture-in-picture feature allowing players to quickly explore the map while keeping an eye their avatar’s progress. The game is now available for purchase in the Windows Games Store for 6.99 USD and supports both Windows 8 and Windows RT. The DLC offerings for A World of Keflings are not yet available on Windows 8. A World of Keflings on Windows 8 does not include multiplayer or Avatar FameStar functionality. A World of Keflings for the Wii U will release later this year. The sequel to the hit XBLA title A Kingdom for Keflings, A World of Keflings is a city-building game featuring tiny, obnoxiously cute characters called Keflings who need help building their kingdoms. Players play as a giant and take a journey to three kingdoms (Ice, Forest and Desert) making friends with Kefling characters along the way, helping them complete tasks, and building and customizing elaborate kingdoms for the Keflings. Players teach Keflings to harvest resources like wood, stone, magic crystals and wool, and build up a booming economy of production, resource refining and building construction. The game contains no antagonist or conflict, resulting in a pleasant, play-at-your-own-pace city-building adventure. A World of Keflings first released in December 2010 on XBLA. Since that time the game has added three new themed kingdoms (Alien, Candy and Graveyard) as DLC titled “It Came From Outer Space,” “Sugar, Spice and Not So Nice,” and “The Curse of the Zombiesaurus.” The XBLA version is also one of a select group of games to support Microsoft’s Avatar FameStar program. A Microsoft games studio published game coming to Wii U!!?? @Johnny Ortiz they're probably trying to sway Wii U customers. I bet the second release of this series won't be released for Nintendo consoles, unless they try a similar technique with the handheld in an attempt to breech that market, too. No catch. The Keflings games are owned by NinjaBee not by Microsoft. Will there ever be a Keflings 2 ? Do the same for Xbox One. Thanks. I adore A World of Keflings on the Xbox 360.I've been playing it with a friend and we've quite recently completed the first dlc pack and have 2 more to overcome.There's no real difficulty in this game as there's no real way to lose yet that winds up making the game considerably more enjoyable.I'm tempted to purchase this again on Windows 8 for the additional gamerscore.In the event that you have a Wii U then I can't suggest buying this sufficiently game when its released.It'll be comfortable on the Wii U pretty much as it is on the Xbox 360. What a great opportunity to get rid of all your infinite problems in just glimpses!! Surprised by the way Cheap Gaming Monitor works. They are very functional! I hope everyone gets to utilize it for their good! Unveiling new game at PAX East!